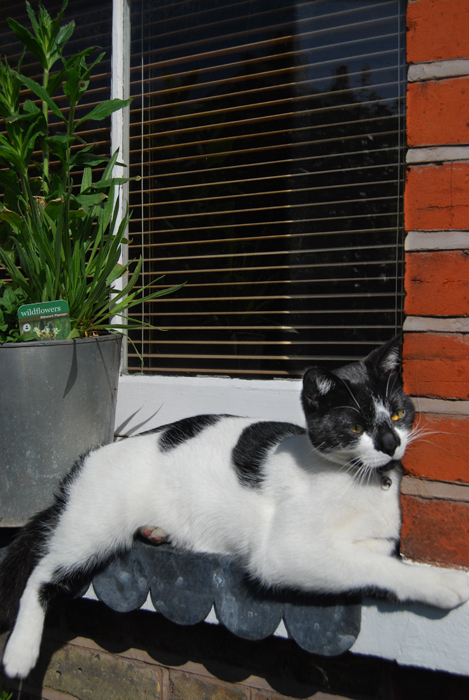 Now we cats are highly intelligent creatures and we can cope with most situations – including hot weather. We’ll find the coolest spots in the house and garden but there are one or two things you humans can do to help make sure we’re nice and comfortable when the temperatures rise. 1) Make sure there are nice, dark cool places around the house. I like lying on the bed during the morning, so my staff keep the bedroom curtains closed when it’s hot and sunny. It’s hard to snooze with the sun in your eyes! 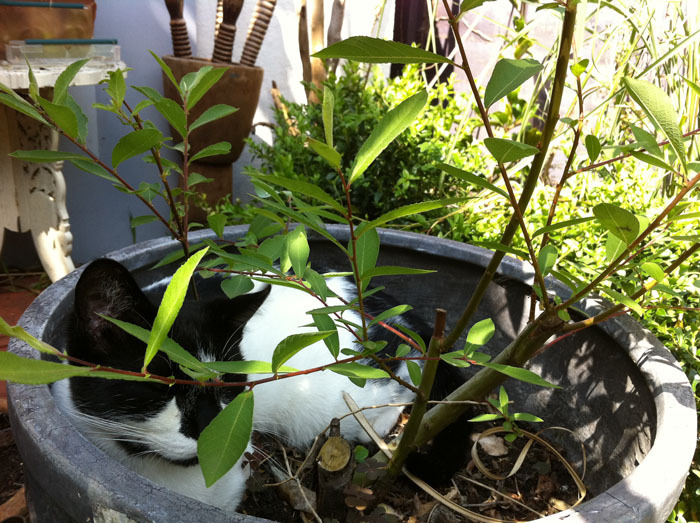 I also like to curl up and nap under a shady plant in a large pot in the garden – the soil keeps me nice and cool. 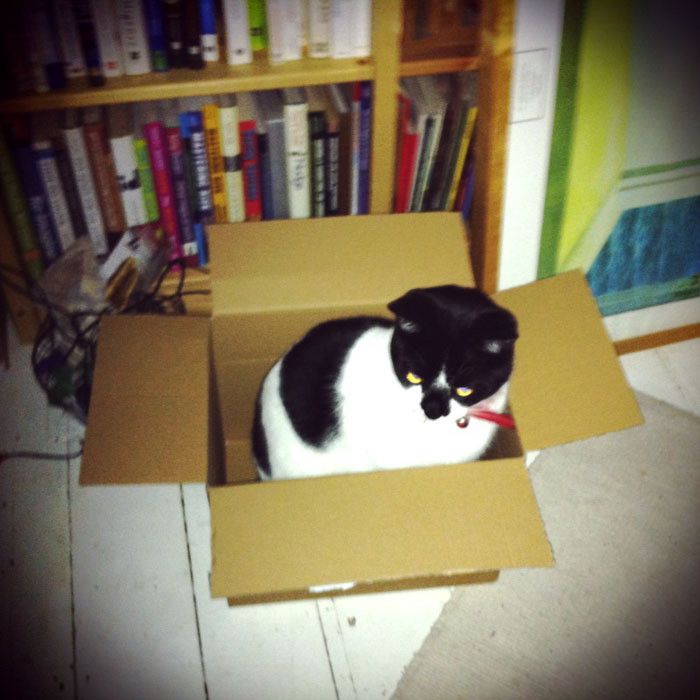 You could find a nice box, pop a towel in it and place it somewhere nice and cool, for your cat to snooze in. And you could wrap an ice pack in a towel and put that in the box for extra coolness. Or dampen a towel with nice cold water and leave it on the floor. We’ll know when it’s right for us to lie on so don’t try to force us. Ha ha – as if you could! The main thing here is not to leave us in excessively hot conditions such as an unventilated room. And be careful if you need to take us to the V. E. T. – don’t cover our carry cases no matter how much noise we make. Try the ice pack in a towel trick to make sure we stay cool. Our tummies, pads, armpits, under the chin and on the outside of our ears are where we get the warmest, so please focus on keeping these spots cool! 3) Most of us like to be combed and for good reasons. Did you know that matted fur traps heat? So by combing us you’re making sure air flows freely through our fur which will help to keep us cool. I’m a short-haired chap but I can imagine how horrible it would be to have long fur with tangles and knots in it. 4) Just like humans, we cats can become dehydrated during hot weather. So please make sure our water bowls are kept full. Leave some extra bowls around as well and in the garden too. 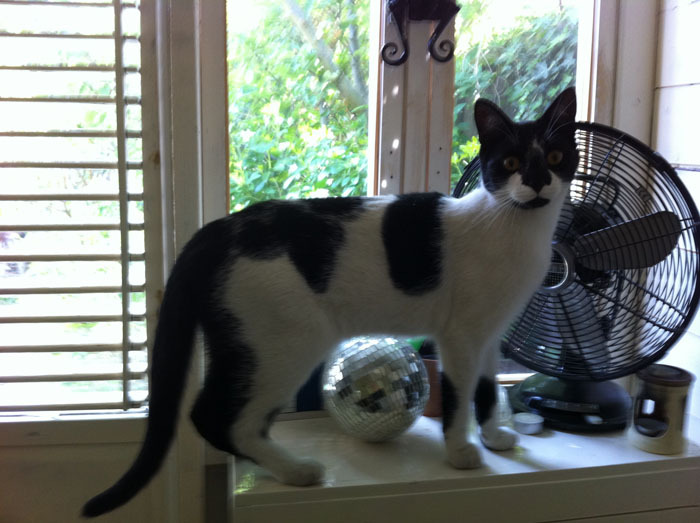 5) I’m a playful kind of chap and I like nothing more than chasing the laser dot. But my staff are under strict instructions not to encourage me to run around in the heat. I’ve told them it’s best to help me stay calm by sitting and stroking me. And there’s nothing wrong with that! 7) Don’t be concerned if we sleep more on hot days. We need 16 hours a day and are likely to nap more when it’s hot rather than rushing around like mad things. 8) You may notice your cat grooming more than usual. Again, no cause for concern – it helps us to cool down. It’s a bit like sweating in humans only not as unpleasant. 9) Take notice of your cat’s feet. We have sweat glands on our paws, so if we leave wet prints, we’re sweating and will need to top up our fluids. You can try cooling us down by dipping our paws in water, but you may not get a good reaction! 10) We don’t pant very often – certainly not as much as dogs, but we will pant to take on cooler air if we are very hot. But keep an eye on it because heavy panting could be a symptom of heat stroke (see above). 11) Fleas – little parasites – who needs them? Certainly not us cats. Please make sure you protect us with monthly parasite control. Even if we make a fuss… My staff got me a one-off injection at the V.E.T. to see me through the year. Er, thanks guys. 12) Did you know that outdoor cats can become sunburned, particularly on the tips of their noses, ears and other less hairy bits? And white cats are more susceptible. So apply a pet sunscreen, which can’t be licked off, to the nose and ears of pale-coloured cats when they do go outside. Check with your V.E.T. first though to make sure the sunscreen you choose is safe for cats. 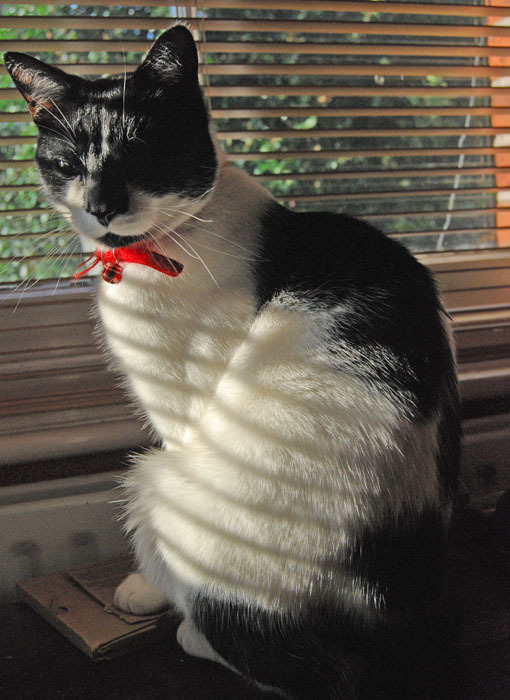 This entry was posted in Cat health, Fascinating cats, Weather cat and tagged cat health, cat welfare, keeping cats cool in hot weather, looking after cats on June 13, 2014 by MrMonty2014.